If you were anything like me as a kid (or even an adult! ), if you couldn’t get your hands on some Lego, you’d turn to the next best thing: K’nex. If you’re into making very precise but elegant works of toy art, K’Nex is ideal. However, this yearlong project blows anything I ever created out of the water. 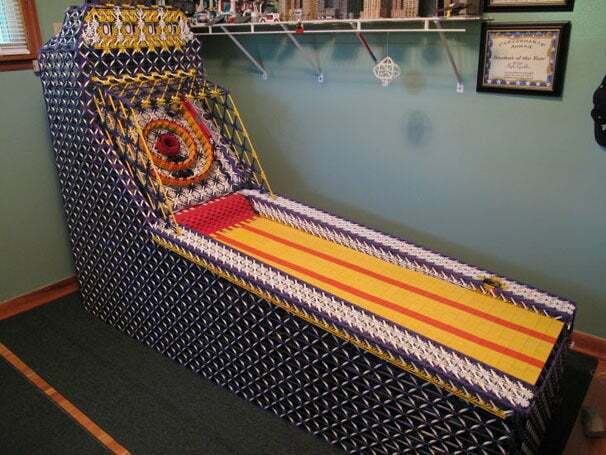 Just over a year ago K'Nex guru Kyle on Instructables began a journey to make a working, life-sized Skeeball machine out of K’nex. On July 26, he finished the creation, and you can’t be disappointed by his efforts. The project is entirely mechanical, and will happily accept your quarters if you would like to play a game. The build contains six motors, four of which are for the counter at the top. It’s worth noting that it is made entirely out of K’Nex--the only non-K’Nex pieces are a couple of rubber bands and paper to keep count. Dimensions wise, the whole thing measures roughly 85 inches long and 57.5 inches tall, but Kyle isn’t quite sure how many pieces it took to build--you can hazard a guess in the comments. It may be made out of K’Nex, but that hasn’t stopped Kyle’s friends and family pitting themselves against the machine. Apparently, the game takes about a minute and a half to play, plus ball-throwing time. Unfortunately, Kyle intends to destroy the whole thing in the coming week, so enjoy it while it lasts. Considering how many pieces it probably took to build, he’s probably going to need a few parts to build more impressive projects such as this one. Check out his project page on Instructables to see more images of the Skeeball machine, and start plotting how many more pieces you are going to need in order to create something just as amazing, if not better—some of us GeekTech writers take a lot to be impressed after all!